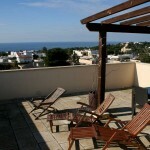 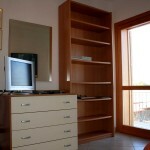 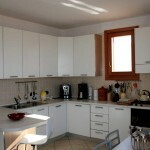 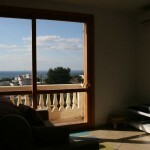 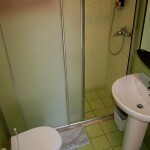 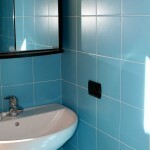 Smart apartment with sea view and swimming pool for sale in Italy, Puglia. 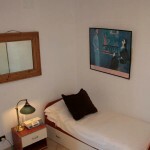 This apartment is set at the first floor of Melograno Residence, a small brand-new complex of 6 houses with communal swimming pool. 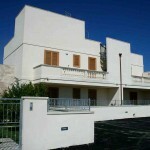 It is an ideal overseas home spread on 2 stories (first and second) offering a brightly living room with a fantastic balcony with sea view open plan kitchen and sofa-tv corner, two double bedrooms, a bathroom, an outdoor spiral staircase leads to the second floor where is set a third double bedroom with bathroom, and great terrace with nice sea view. 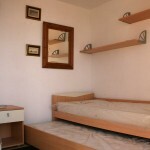 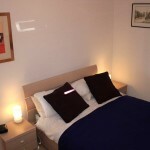 The apartment features all the comforts that a holiday house required: swimming pool, car parking, hot/cold air conditioning, solar panel for the hot water, wooden fixtures, nive open plan kitchen with appliances. 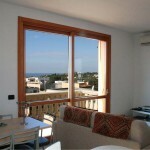 Great location, only 900 mt from the beach and piazza, 2 km from Gallipoli long beaches, 5 km from Nardò old town, 20 km from Lecce and 70 km from Brindisi international airport with direct flights from London, Brussels, Paris, Rome, Milan, Stockholm, Barcelona, Eindhoven and other Italian airports. 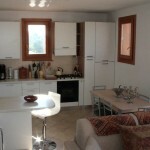 Good rental potential if rented as holiday home.